The custom balanced body and the conical undulation generates the vibration and flashing of bait fish. 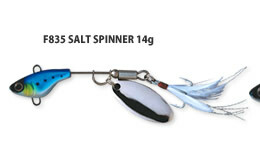 No line twist that is usually seen in the normal tail spinner lures. It swims like a minnow in the strong current. 14g is for the shallow range, good for shallow fishing points. 24g is for the deep range, good around rocks or ports. Вы сейчас на странице: DUEL&YO-ZURI Приманки DUEL серия SALTWATER SALT SPINNER.